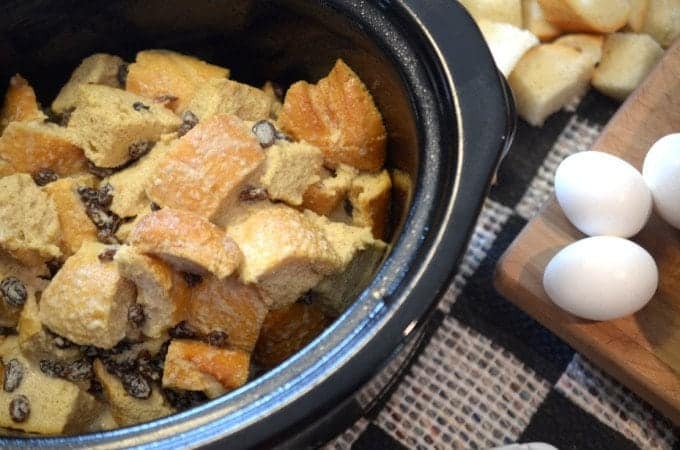 Let your slow cooker take care of dessert by making this Crock Pot Bread Pudding; a simple loaf of bread, some eggs, and a few other basic staples. Your whole family will love this crock pot dessert! Make this dreamy slow cooker dessert recipe in just a few hours. We are a busy gang, with six kids coming and going, a house in town, one on the lake, and two parents who have full-time professions. That said, we have learned to embrace the convenience factor in many facets of our lives, including when it comes to preparing food and feeding our boys. It’s no wonder we love good slow cooker recipes, and with great desserts like this one, I always have to ask why it is that we don’t put this kitchen power player to good use more often. This crock pot dessert is so simple to make even a kid can do it. How many times have we heard that simple is best? Bread, eggs, and a slow cooker; throw in a few other goodies, and you’ve got a warm and wonderful dessert, all with minimal effort. How could this be any better?! 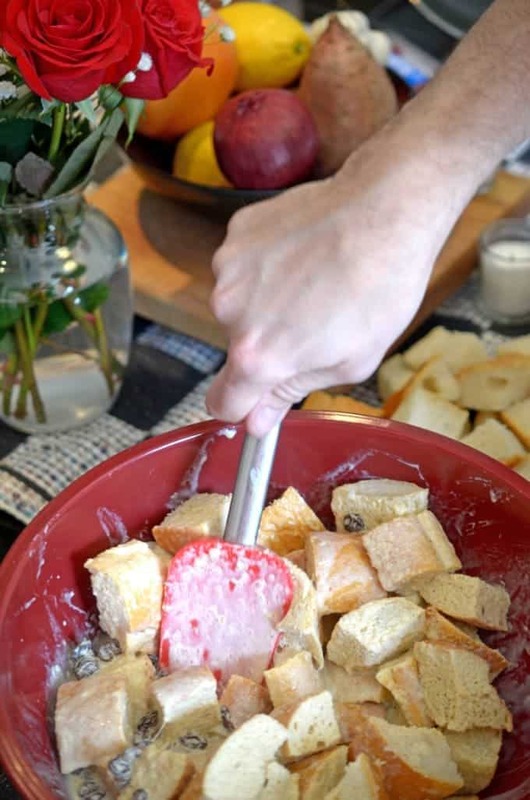 Try this crock pot bread pudding today. 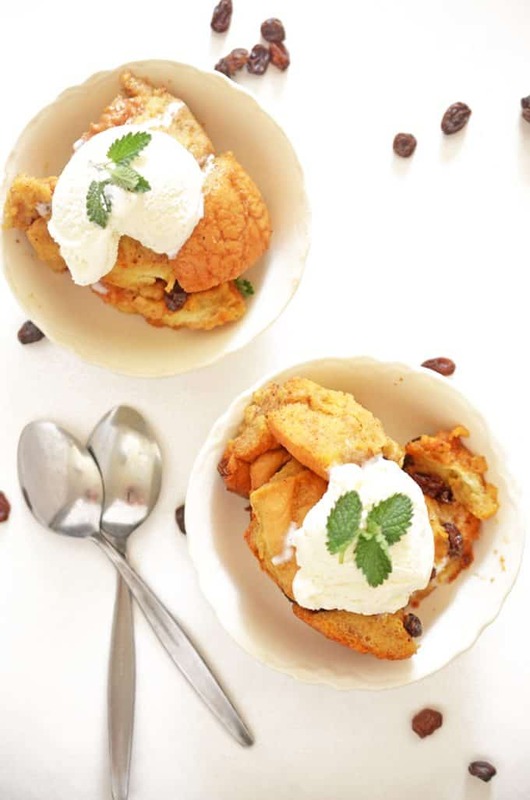 Our kids love this slow cooker bread pudding. It’s easy with minimal effort and just a few everyday ingredients. Turn your slow cooker on and let it do to work for you. Throw a dollop of ice cream on this one, and it becomes a virtually perfect dessert. 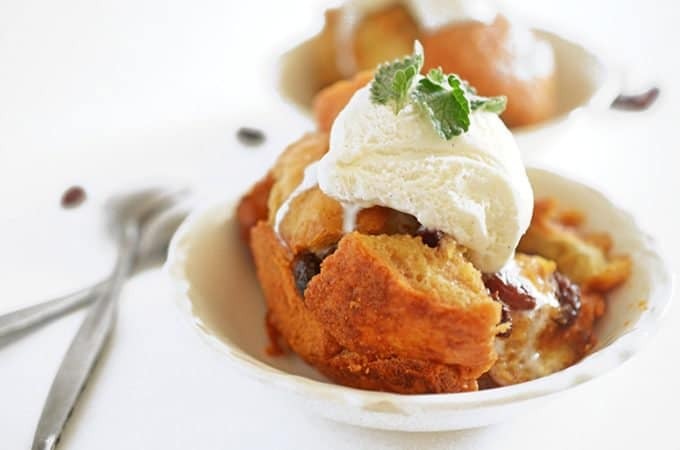 Vanilla ice cream is optional with this slow cooker bread pudding, but highly recommended! We’ve made desserts in the crock pot before, and our readers have loved the results! 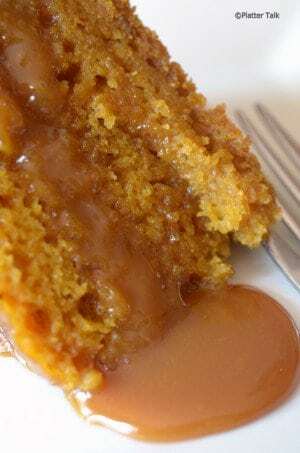 Be sure and have a taste of this slow cooker dessert, our Sticky Caramel Pumpkin Cake! Our Slow Cooker Sticky Caramel Pumpkin Cake is one of the most viewed recipes on our site. Having been pinned over a quarter of a million times, it’s fair to say that making dessert in a slow cooker just may be the way to go! When I served this bread pudding, our 11-year-old foodie son, Isaiah, asked, “What makes this a pudding?” I thought this was a great question and so we did a little research on the history of this sweet creation. 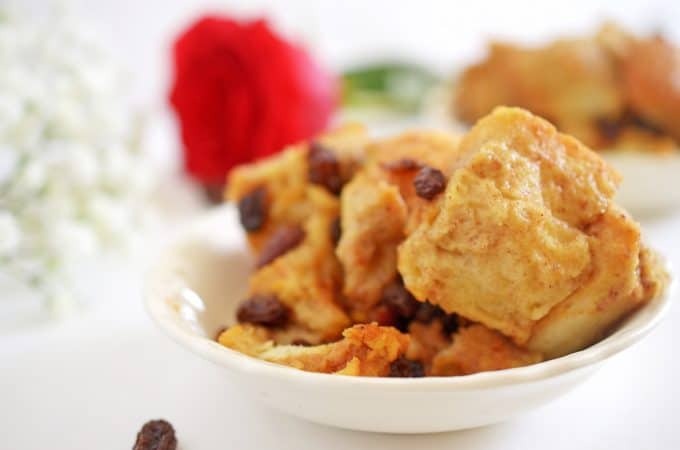 It turns out, bread pudding dates all the way back to the 11th century, when frugal cooks looked for frugal ways to use stale and leftover bread instead of letting it go to waste. Almost a thousand years later and this form of dessert is still going strong. Our kids loved this one, their parents loved this one, and our little chihuahua, Buddy, was fantasizing about loving this one. Get your slow cooker out of the cupboard and make this a reality. How do you make bread pudding? We would love to hear! You get the idea! As with all recipes: Make. It. Your. Own! This slow cooker bread pudding is an easy Crock Pot Dessert that the whole family will love. Pre-heat slow cooker to high setting. Place cubed bread in large mixing bowl, set aside. Combine remaining ingredients in medium size mixing bowl, whisk thoroughly. Pour liquid ingredients over bread cubes, stir until bread is completely coated. Transfer bread mixture into slow cooker, reduce heat to low. Cook for 3 hours or until knife inserted in center comes out clean. May substitute whole milk for cream. For added texture and enhanced floor, place cubed bread under broiler in oven until toasted. Every time I see bread pudding I think of my darling Father-in-Law. He simply loved it and I would have loved to serve him this delicious looking pudding. I can’t believe you can make it in a slow cooker. How great is that!! Love bread pudding but I have never made it in a slow cooker. This looks so good. I love new ideas for my slow cooker. Can’t wait to try. bread pudding and a cold winter morning – nothing beats that. I love your slow cooker version of bread pudding. Looks delicious! I love bread pudding, I bet cooking it this way will make our house smell divine. Win win! Your method to making bread pudding sounds so much better than what I’m used to. Look very elegant and delicious. I am so excited to make this! We are huge bread pudding in our house! This would be perfect for our Sunday brunch! 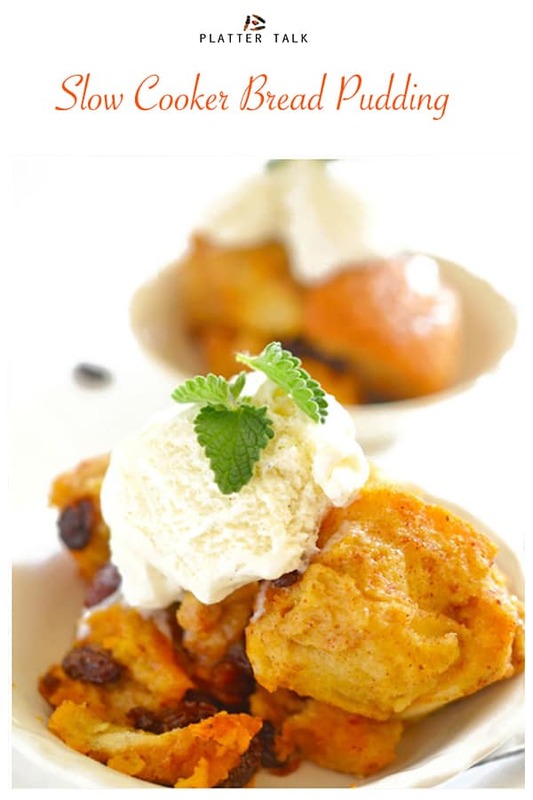 Bread pudding is my favorite and I love adding raisins to mine as well! Sometimes I like to throw in a little rum too! I always forget that my crockpot can be used for more than just dinners. What a great idea to have dessert merrily cooking while I do other things! 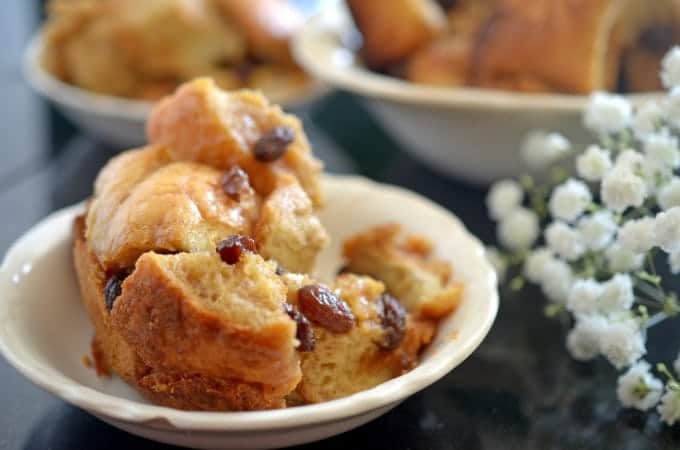 I have never made a bread pudding before, but yours looks easy and delicious, perhaps this would be a nice addition to our Christmas Day brunch!!! 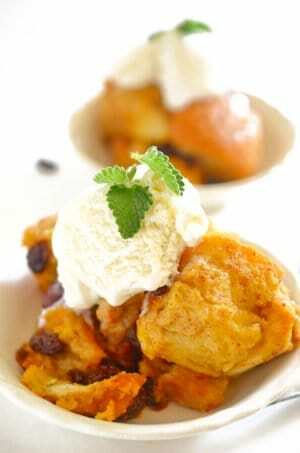 We LOVE Bread Pudding!!.. and just did a Pumpkin Bread Pudding a couple weeks ago. Will have to try your recipe as winter rolls in. Thanks!! Thanks for the comments, Geoffrey; it’s amazing that something this simple can taste so wonderful! Oh wow, I can’t believe I’ve never thought to cook desserts in the slow cooker before when there’s deliciousness like this waiting for us. 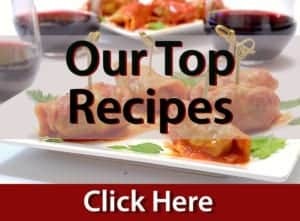 Just curious, have you ever added any port or brandy to this recipe? I can just imagine the flavours, all covered in custard for a cheeky Christmas dessert! I love bread pudding and I love using my slow cooker, so basically, this is recipe perfection! I must admit that I have never cooked in a slow cooker but must say you are really tempting me with Bread Butter pudding. One of my favourites. Making dessert in the slow cooker is totally the way to go! I did that over the holiday and wondered why I never used it for dessert before. LOVE this recipe, pinning to make soon. Thanks, Deb. Great to hear from you as always! Is there a special bread to use for this, or just any bread? Elaine, you can use any wheat or white bread (or rolls.) Some folks like to give their bread a toast in the oven, under the broiler for a minute or so for extra firmness and texture; the toasting process can also enhance the bread pudding’s flavor as well. Thanks for your question and thanks for stopping by Platter Talk. You can uses any bread ???? But in New Orleans LA we use French french ????. I love the idea of a recipe that can just cook away in the slow cooker like this! Your Bread Pudding looks and sounds fantastic! 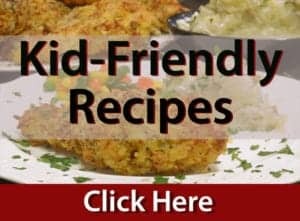 Kellie, I love your comments as I think you are spot on; we under-utilize our slow cooker which really puts as at a big disadvantage when it comes to saving time and making great meals for the whole family. This looks so good and a great idea to utilize the slow cooker. Janette, it’s great to hear form you and yes, this is good stuff! 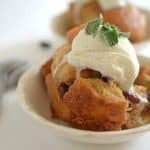 Bread pudding is one of my favourite desserts, love how easy this is to make in a slow cooker. Thanks for the comments, Jen!